Tattoo – Art on skin. Tattoos have long ceased being mere designs or marks on the human body. Nowadays, they are art on skin and, regardless of fashion, are a way to customize on the human skin, through the universal language of art, what one believes as being his/her essence, feelings, beliefs, ideologies, traditions and even to cover up imperfections. According to archeological evidence, there are records of tattoos dating back to ancient Egypt between 4000 and 2000 BC and even older records found in the famous Ice Man, a mummy of approximately 5,300 years old discovered in the Alps in 1991. The blue lines on his body may be vestiges of the oldest tattoos ever found, or perhaps scarring from some medical treatment adopted by the Stone Age people. More than 50 tattoos were found on his body which, according to experts, were of religious significance. One of the goals of tattooing was to enable an individual record his own history, with representative facts marking his existence, bearing them on the skin during his constant travels. The practice spread across the continents, with different uses, such as religious rituals, identification of social groups, mark prisoners and slaves (common practice in Imperial Rome), demonstrate love for someone or adorn the body, among others. The thematic motifs expressed in tattoos vary and are defined according to the personality and artistic style of the tattoo artist and the lifestyle and expectations of the tattooed. Many indigenous tribes in Brazil bear tattoos on their bodies. The waujás and the kadiwéus are some of the indigenous tribes that use permanent painting to express their rituals and reverence towards elements of nature. In the West, during the Middle Ages, tattooing fell out of favor, forbidden by the Church. The tradition revived in 1769 when the English explorer James Cook, in his expedition to Polynesia, recorded the custom in his log book as follows: “Both men and women paint their bodies. In their language, this is called tatau. They inject black ink under the skin in a way that the design becomes indelible”. In Brazil, modern tattoos appeared in the 1960s, introduced by Danish Dane Knud Harald Lykke Gregersen, known as Lucky Tattoo, considered to be the first professional tattoo artist in the country. For the first time, the Brazilian Post issues stamps focusing on tattoos, aiming to record, through Philately, this way mankind has found of demonstrating, on his own body, his preferences and perceptions, his loves, religion, lifestyle and everything else that can be expressed through art on the skin. 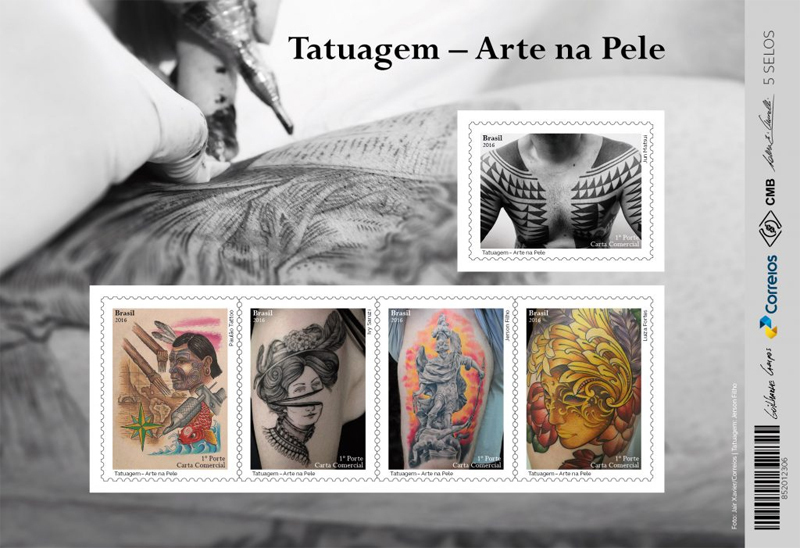 On the background, the miniature sheet shows an image of the process of creating a tattoo and, on the foreground, five stamps with art by different Brazilian tattoo artists. On the upper part of the miniature sheet is a stamp showing tribal art by tattoo artist Jun Matsui which, according to the artist, represents a “clothing”, an adornment referring to the primitive energy of the human being and its integration with wild nature. Below is a sequence of four stamps. 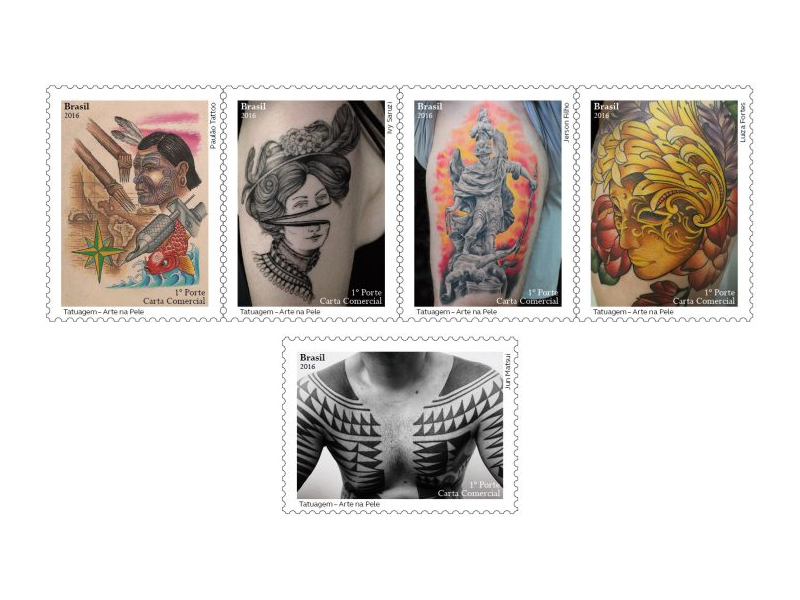 The first from the left shows art by tattoo artist Paulo Tattoo, formed of elements representative of this form of expression, such as the tattooed Indian; the tatau, an indigenous artifact for tattooing; a tebori tattoo, meaning “handcrafted” or “tattooed by hand”, one of the most traditional methods of tattoo in Japan and a modern tattoo machine. The second stamp shows a tattoo by Ivy Saruzi, artwork entitled: The Lady. 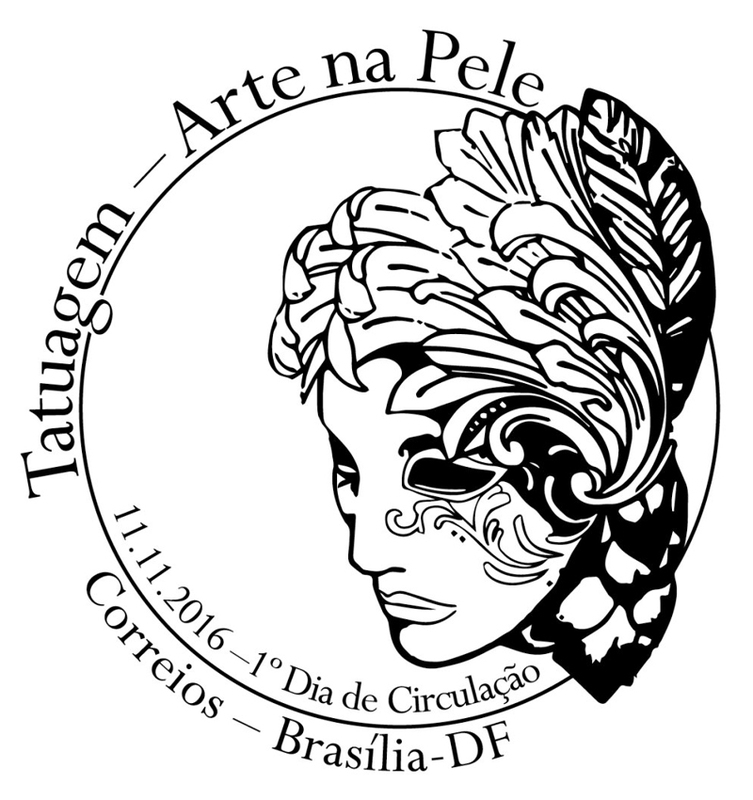 The art on the third stamp, by tattoo artist Jerson Filho, focuses on a stylized image of the Archangel Michael. Finalizing the collection is work by the tattoo artist Luiza Fortes, showing an art nouveau style Venetian mask. The art contains warm, sensual bronze and old gold tones with great depth achieved by using light and shadow to highlight the magic of the secretive eyes and sensual lips.